Press release distribution is one of the most misunderstood procedures in a company’s marketing and publicity strategy. Some people think issuing a press release is as simple as pressing the send button on the keyboard and whatever was sent out would be published the next day. While there are also those who think press release distribution involves bribing journalists to encourage them to write a story. In this post, we will try to shed some light and clarify those misconceptions about press release distribution. Then we will also look at five (5) ways on how to improve your press release distribution process. Let’s look at the common misconceptions about the process. Misconception one: Press release distribution is as simple as pressing the send button on your keyboard and then it will be published the next day. The truth is you need to have an interesting story. You need a headline that grabs the attention of the readers. You need a story that will speak to or touch the readers. If your press release lacks any of these elements, chances are it may not even get read by a journalist. If your press release is only talking about an ordinary product or a service that is similar to everything else out there in the market already, it may not even get opened. Misconception two: Press release distribution involves bribing journalists to write a story. Wrong again. The truth is Australian journalists (and the Australian media in general) are one of the most highly respected and regarded in the world. They are well-respected for their independence and integrity. This means that if you have a genuinely captivating story that will be of interest to readers, your press release will have a better chance of getting used by the media. And you don’t have to pay anything. All you need is an interesting story. Now, let’s have a look at five (5) effective ways on how to improve your press release distribution process. 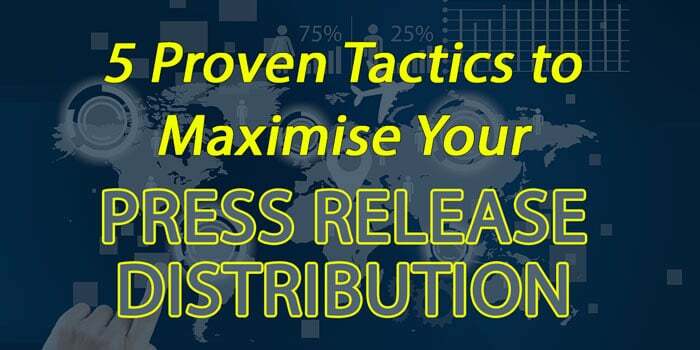 Whether you are doing the distribution in-house or you’re using an external agency to do the distribution for you, these proven tactics will help improve your press release distribution process. Tell an interesting story – Your press release has to stand out from the hundreds of emails that get sent to journalists every day. Remember you are competing for a journalist’s attention, so you have to tell an interesting story. And tell it straight away. Get straight to the point – Provide a summary and highlight the most interesting item in your press release. Avoid the chest beating and adjective laden paragraph to describe your company or your client. Go straight to the point and tell the interesting story. Remember, you only have a few minutes of a journalist’s attention before he or she decides to open and read your release or to delete it. Talk to the right journalist – Do your homework. Read the articles written by the journalist for the past month or so. This will give you an idea of what topics or issues the journalist is writing about. Most journalists are assigned to particular beats or topics – e.g. banking and finance, derivatives, FinTech, financial planning, trading and investment. Make sure to send your press release to the right journalist covering that topic. You don’t want to waste your time and effort by sending a release about share trading to a journalist covering life insurance. Keep it short – An ideal press release is one page long or one and a half at the most. If you can’t tell all the important facts and details of your release in 1.5 pages, you may be giving too much unnecessary details anyway. And besides, journalists will not have all the time to read a 4-page press release. According to a survey done by Greentarget, a US-based communications company, most journalists spend less than a minute reading press releases. With journalists being bombarded with press releases – 45% of respondents said they get 50 or more a week while 21% get at least 100 – they spend little time reading them, according to the survey. Keep it simple – Avoid jargon and too many acronyms. A press release must give useful, factual information. It is supposed to be informative and educational, not confusing. Don’t be afraid to use short and simple words that can best describe what you’re telling in the press release. Avoid long and complicated words that no one understands. These are five proven and time tested ways that have delivered positive results to press release distribution. Try and implement these and let us know the results. Tell us about your press release distribution tips that have worked wonders.